Most regions have been experiencing climate change in various forms over the past few years. 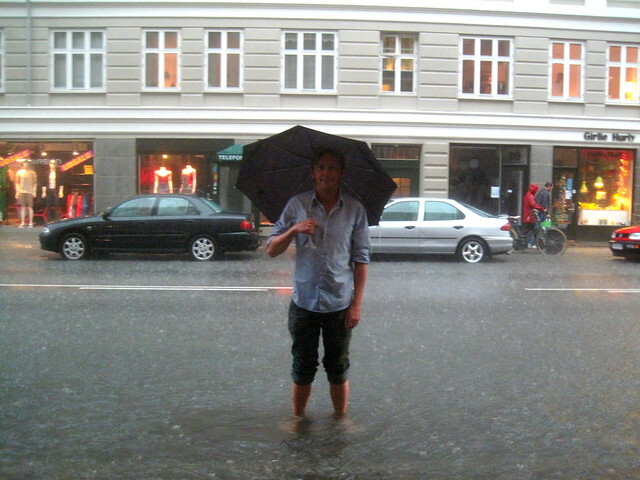 One of the changes we're experiencing here in Denmark is sudden and torrential rainstorms in the summer. Epic, tropical rainstorms. One of them hit last Saturday and the capital region recieved in two hours the normal rainfall we'd get over two months. It was, indeed, epic. I was at Bang & Jensen café in the Vesterbro neighbourhood and the storm was a spectator sport for those of us inside. It was a great atmosphere and we had a paper boat competition, setting our contraptions afloat in the street. Needless to say, none of us had cellars to worry about. I've never been so pleased to live on the fourth floor, although my kitchen floor was covered in a thin layer of water because of an open window. Over the past few years of these torrential downpours the talk afterwards is always about the massive cost to the insurance industry in payouts and about the hopeless run-off/sewer pipes beneath the city. They were never designed for this kind of rain and replacing them with wider ones is a massive undertaking. Interestingly, the past couple of days have brought new proposals to light in the media. One expert from the Danish Technical University goes as far as saying that buildings in high-risk areas may have to be torn down and replaced with building geared for rain, as well as designed to improve water flow through the streets. Which would be interesting from an urban design point of view. Getting to plan new buildings and areas and, in the process, create more liveable spaces - for when it's not raining like this, of course. Another expert, this time from the company that runs the sewer systems in Copenhagen, proposes a canal system like Amsterdam or certain Chinese cities, that would allow the water to flow away from the streets and cellars in a planned fashion towards green areas. Another fantastic urban planning opportunity if it arises. Not surprisingly, politicans are hemming and hawing about THAT idea. Another massive cost but one that comes with a brilliant opportunity to make improvements in the liveableness of the city. Putting up lightning rods may be a good idea, too. Copenhagen was hit by 5000 lightning strikes during the storm. Today, Monday, there are still several motorways that are closed, like this one. Train traffic is affected greatly, as well, with the tracks looking like this in many places. Mary here at Copenhagenize Consulting was two hours late coming into the city from Ballerup because of train cancellations and had to take a bus put on by the train company. Most of the negative effects of the storm are obvious and massive. Very few cellars escaped flooding. In my courtyard there was a beehive of activity yesterday as people scrambled to get stuff out of the cellars and try to dry it before the next rainstorm yesterday evening. Cycling and walking around the city today the whole place smells like a rotting, wet dog. The scent permeates the air here, wafting up from soggy cellars. It's constant. On the bright side, it's a great day for the bicycle, what with motorways submerged and trains cancelled. The bicycle is once again given an opportunity to prove it's workhorse worth as a fine transport form in lieu of others. In my courtyard there is a large area for large garbage that can't fit in the containers. It was filled up this morning. People were emptying their cellars and using the opportunity to just chuck stuff out so it was a free flea market. I nabbed a great little bicycle for my daughter and one for my son, too. I'm going back later for those coffee cups, if another resident doesn't beat me to it.